In this episode, I talk with Barry Glassman, who is the President and Founder of Glassman Wealth Services®, where he leads an RIA that not only oversees a billion dollars of assets but has also been named best place to work by just about every major publication in the DC area. It’s amazing how Barry has found a way to both scale his business and his team very quickly, while at the same time creating an incredible place to work, this isn’t common in financial services and we cover a lot of how he does it in our conversation. Besides the best places to work awards, Barry’s also been featured in major publications such as The Wall Street Journal and Washington Post and has been honored with advisor awards from Barron’s, Financial Times, and Investment News to name a few. Outside of the office, Barry’s an incredible chef and photographer and we speak to how incorporating this into his business and sharing it with his clients has helped deepen his connection from that of just a business relationship. We start off with the story of how Barry and I actually met and how this speaks to the importance of getting outside of your industry to learn and surround yourself with other big achievers. Some great insights here from Barry. Next we get into FinTech and how this is changing the financial advising world and what you can do to take advantage of it as an advisor. There is also a great takeaway here that Barry learned from his client newsletter when he decided to run a secret survey on his clients to see who was actually reading it. Funny story that you all are going to love. Finally we dive really deep into what sets Barry’s firm apart when it comes to building a team and the 1 characteristic he’s found that is critical in his hiring process. Also Barry shares a great outside of the box interview question to seek out this characteristic, I’m guessing a few of you will borrow it from him! [05:30] How to host your next event like a pro, so guys like Barry go out of their way to attend! [07:12] Why it’s critical for you to look outside of the financial services industry if you really want to stand out. [13:00] Why great customer services is no longer special, it’s a minimum standard. [15:44] How is FinTech changing the value we can bring to our clients? [18:53] Find out how you can use technology to create more meaningful conversations with your clients. [24:16] Is anyone actually reading your newsletter? Barry shares a story that highlights the 3 things your client communication must include in order to be effective! [29:38] Discover the financial advisor website do’s and don’t’s and how Barry interrupts the pattern in order to separate himself from the pack! [34:09] Barry shares his secret to showing your clients true objectivity. This may be one of the coolest things I’ve ever heard a financial advisor say! [39:02] Don’t just talk the talk! Learn how you can “interrupt the pattern” at every point of communication, from your ‘About Us’ page on your website to your ‘Out of Office’ autoreply. This section is filled with gold and will help you build real relationships with prospects, clients, and influencers. [49:09] What does it take to be awarded ‘Best Place To Work’ and why do most financial firms never even get considered! [56:51] Barry reveals the single most important characteristic when hiring. [01:00:51] Learn how to transfer the trust your clients have with you to your entire team. [01:06:55] Barry shares his favorite business book, which also happens to explain his company’s philosophy more than anything else. [01:08:47] Why hitting a billion under management doesn’t matter to your clients. Remember, bigger isn’t always better. [01:11:41] Find out why Barry thinks of Jeff Bezos when he hears the word successful. [01:13:02] The best red wines you never heard of! Thanks for checking out our latest show, here’s this weeks featured review! LockwoodJ really appreciate the kind words and super excited for some of the guests we have booked and coming up so stay tuned, more big names to come including one of the largest RIAs in the country. By the way, for you out there who haven’t connected with me on Twitter yet and have ideas on future guests, look me up at @brad_johnson and let me know who I should have on! [00:00:38] Brad: In this episode, I talked with Barry Glassman who’s the President and Founder of Glassman Wealth Services where he leads an RIA that not only oversees $1 billion of assets but is also been named Best Place to Work by just about every major publication in the DC area. It’s amazing how Barry’s found a way to both scale his business and his team very quickly while at the same time actually creating an incredible place to work. From my experience, this isn’t really common in financial services and we cover a lot of how he does it in our conversation. Besides the Best Places to Work awards, Barry’s also been featured in major publications such as the Wall Street Journal, Washington Post. He’s also been honored with advisor awards from Barron’s, Financial Times, Investment News to name just a few. Outside of the office, Barry’s probably even more impressive as he’s an incredible chef and photographer and we speak to how incorporating this into this business and sharing it with his clients has helped deepen his connection from that of just a business relationship. Here are just a few highlights from our conversation. We start off with the story of how Barry and I actually met and how this speaks to the importance of getting outside of our industry to learn and surround yourself with other big achievers. Some really great insights here from Barry. Next, we get into FinTech and how this is changing the financial advising world and what you can really do to take advantage of it as an advisor. There is also a great takeaway here that Barry learned from his client newsletter when he decided to run a secret survey on his clients and see who’s actually reading the thing. Funny story you’re all going to love. Finally, we dive really deep into what sets Barry’s firm apart when it comes to building a team and the one characteristic he’s found that is critical in his hiring process. Also, Barry shares a great outside-of-the box interview question to seek out this specific characteristic and I’m guessing a few of you are going to take it and borrow it and put it right into your interview process. [00:02:27] Brad: Okay. One last thing before we get to the conversation. If this conversation with Barry leaves you wanting more, Barry’s done something really special. 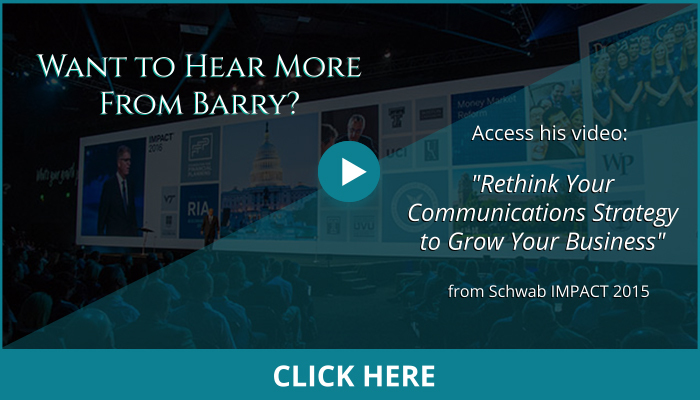 He’s made available a private 60-minute keynote he gave at Schwab’s IMPACT Conference last year and he’s made that recording available to all of you Blueprint listeners. It’s available right at the top of our show notes. You can get it at BradleyJohnson.com/27 and as always, there’s links to everything else there too, books mentioned, people discussed as well as a complete transcript of the show. And as usual, if you want to stick around after the show, I’ll feature an iTunes review from one of our Blueprint listeners. Thanks to all of you who have carved out a minute or two to leave a review. They are all truly appreciated and do a ton to help our show rank on iTunes when people are out there searching for great ideas and content for other financial advisors out there. As always, thanks for listening and without further delay, my conversation with Barry Glassman. [00:03:29] Brad: Welcome, everyone, to this episode of the Elite Advisor Blueprint. I am excited to welcome Barry Glassman. Welcome, Barry, to the show. [00:03:38] Barry: Thank you. A pleasure to be with you. [00:04:04] Barry: Ian tells a mean story. [00:04:06] Brad: We finally get to the end of what he had to say and you just so happen to be his financial advisor. So, I’m excited to have you on the show. [00:04:15] Barry: Well, thank you and we have a lot of mutual friends. I’ve spent some time on your podcast and looking around and hear from Joey and Ron and Tucker and a few others, a lot of people I respect. So, I feel privileged to be a part of that group. Thank you. [00:04:33] Brad: Yeah. It’s long overdue. It’s funny when you surround yourself with people you really respect, they just bring more of those type of people right your way. [00:04:41] Barry: That’s cool. Then we also have to point out we are both at mastermind talks this past year and Jayson Gaignard who is the ultimate connector spend so much time understanding each and every person and what they do, and the personality and what they’re looking for. And first session what did he do? [00:05:03] Barry: Sat you and I right next to each other and just set the tone for the conference. [00:05:24] Barry: For 20 minutes. [00:05:26] Brad: So, there’s a lesson there from Jayson’s events and how he runs mastermind talks because obviously, you run some really cool client events. A lot of our clients run client events. The thought process that Jayson puts into hosting 150 people and the purposeful intentionality of us sitting beside each other because he knew we would have some mutual conversations obviously in the finance world. And then there was another evening and I’m sure you have a story just like this, Garrett Gunderson who’s going to be on the show in the future, David Bach, they’re at my table. We’re all in financial services and for him to find 150 people, you’re never sitting next to the same person for two or three days straight, I think he actually has an algorithm, doesn’t he? I think he mentioned that. [00:06:09] Barry: It’s all in his head. Well, much like when a magician reveals the aha moment and he walks through and he says, “See, here’s your card,” Jayson did this at the event where at the first day he said, “I really spent a ton of time reading about you and putting this together,” and remember he went down a whole row and he said, “I put you next to this person because of this. I put you next to this person because you both have seven dogs. I put you next to this person because…” And the way he fit them to get through, there’s no gap. And there I fell off like I put you here. Every single person was connected. So, yeah, it’s pretty amazing. So, I was grateful to sit next to you and catch up and get to know you. [00:06:54] Brad: Yeah. And that’s a lesson also in Facebook stalking. You can learn a lot about people on Facebook. [00:07:01] Brad: Make sure you use that to your advantage in business, right? [00:08:04] Barry: What is it? Little Boxes? [00:08:06] Barry: So, when you walk around the financial industry conference and you look at each and every person, firstly, it’s mostly men, it’s mostly white men, it’s mostly white men in their 40s and – it’s me. And the challenge is if we’re all learning, if we all look alike and we’re all learning the same stuff from the same people, how do we stand out? So, I purposely don’t go to – I go to the Schwab IMPACT Conference and I think that’s it. That’s the only industry conference I go to. I want to learn from outside the industry so that I can apply what’s going on in the world and great ideas that from Amazon and Zappos to even the things that RadioShack or Blockbuster did wrong. I want to apply that to Glassman Wealth and our clients. And so, when I hire and I love hiring consultants, absolutely love it. We’ll dive into that as well. If anyone ever says I specialize in the financial service, I’m done. I’m done. I don’t think I’ve ever hired a specialist or a consultant outside of our compliance council who specializes in the financial services industry. I don’t want a website that looks like everyone else’s. I don’t want marketing ideas that other financial services companies are doing. I want to interrupt the pattern of what’s going on and think elsewhere. And we’ve started with a local group called CADRE run by Derek and Melanie Coburn which is phenomenal and I feel so fortunate that they’re in my backyard and that led me to mastermind which is kind of a national version of it. Maverick also fits that profile but that’s different. You’re not learning as much business. It’s a lot of fun and connections and things but to learn from others who are curious, passionate and never done, that’s what I feel about mastermind and as long as I’m invited, I’ll never miss one. [00:10:24] Brad: Yeah. I feel the same way and I challenge myself a couple of years ago. We do a lot of really cool events in financial services, our company does, but the same thing I’ve got to get outside of our box. I mean, this podcast is a good example. I wouldn’t be doing this if I wouldn’t have done that a handful of years back, really challenged myself. [00:10:41] Barry: Well, and you challenge yourself but here’s the difference that you did. How many of your peers have said they wanted to do a podcast? It was the Tucker Max approach. Everybody says they can write a book. The difference between people that Tucker works with and everyone else is they actually wrote a book. The difference between you who said I want to do a podcast and every other person is you did it. So, I think mastermind probably nudged you in that direction to take the risk and you had a couple of luminaries on from the beginning. It really isn’t fair but what you did was you jumped on it and said, “I’m not going to just think about it. I’m going to do it.” And I think mastermind plays a role in that. [00:11:26] Brad: Yeah. How long ago did you challenge yourself to get completely out of our industry with some of these just high-powered groups? [00:11:33] Barry: Oh, day one. Day one, 24 years ago I was all, I mean, when I had a business in college, I was just thinking differently, “What else? What else can I do?” And it’s little things. It’s everything that I do is a recipe. Everything that I do. I love cooking clearly mixing the different ingredients you put together, clearly investment management, the various investments that go together that form the recipe that is the portfolio. Photography, I have a passion in it. Well if I combine this lighting with this lens with this kind of setting and I’m positioned here with a tripod and such that I can get this. It’s a recipe. The team that we assembled, okay, if I can have enough people, more than enough people to cover everything that our client needs then that’s going to free up this and it’s all a matter of a recipe. So, I discovered a few years ago I’ve always thought that way and to discover that next ingredient or how to combine ingredients together to form a better recipe you just got to think outside of your local space in your restaurant and you got to go experience something else elsewhere to say, “Oh my goodness. Did you know if we combine this and add heat, it’ll create this?” It’s always how I’ve looked at things. So, looking outside the industry is just always what I’ve done. [00:13:04] Brad: Let’s go here. I’ve heard you mention that your biggest competition is the Ritz-Carlton which speaks to thinking outside of our industry. Share the thought process there if you don’t mind. And it just felt like whoever I bumped into, if I bumped into a maintenance person, the concierge, anybody, the doorman, anybody at the Ritz, they would just take care of it for me. Now she doesn’t have – she may not have access to the computer but she can call down and say, “Here’s the room number and let’s make this happen.” So, that was really my approach from the beginning. My feeling now is great customer service is no longer special. Great customer service is now a minimum standard for a firm and the firms that say on their website, and you can try and find the best adjective, “We have white-glove. We have exceptional. We have a five-star customer service.” That’s great. And even if you are able to have great customer service, it’s a minimum standard. [00:15:04] Barry: So, amazing customer service, that’s a minimum. The question is now that you have that, what else? Because every firm is going to call. Hopefully, every firm is going to call back right away. Every firm is going to come through for them. The question is, “Well, great. Now, what else?” So, I used to say that Ritz-Carlton is my biggest competition. Now it’s expanded and it’ll change constantly. [00:15:34] Brad: With technology, especially FinTech, I feel like it’s this tag word that everybody is using now but it is getting crazy the way technology is affecting our industry. How is that changed with technology in the last four or five years? I should say do you see – you said it’s evolved from just the Ritz-Carlton. Do you see how that’s involved because of technology? [00:15:55] Barry: It is. What technology is helping us to achieve is what I call the one client philosophy. If we at Glassman Wealth, let’s say the Johnson’s were our only client and we had a husband and wife, we had three kids, one grandchild and they were our only client. The question is what would we do for them? Would we help them with investments? Certainly. Would we help them with think through their estate planning? Absolutely. But remember, they are our only client. So, how often would we reach out to them since we’re working for them full-time? And there we may not reach out every day because they don’t want to hear from us every day but maybe it’s once a month, maybe once a quarter they want to meet with us but maybe once a month they want a summary report that’s designed for them that they’ve curated or designed over, “I’d like to see this here. I’d like to see…” Remember, we’re working for them full time. [00:16:57] Barry: We would customize that for them. Mister and Missis, they may, in fact, want different reports. He wants something with these details. She wants something with those details. Would we miss anything on their tax return? Hell no. We’d absolutely look at their tax return. We’d read their estate planning documents. We would plan out 2017 income of taxable and tax-free income and make sure that they’re optimizing tax rates and things. We would make sure that their kids are educated. We would make sure that we knew about the grandchild and set up a 529 or a trust. The question is why aren’t we doing those things? It’s a couple of reasons. Number one, we have other clients who are busy. That’s not a great excuse. Number two, they may not want or need it. That’s okay. But at Glassman Wealth what we want to do is we want to get closer and closer to not missing anything in proactive and saying, “Congress just voted on this. This applies to you. Here’s what it means. Let’s get together next month,” or, “We’re going to talk to the estate planning attorney and take care of this for you. They’re going to send you a new beneficiary designation form and we’ll take care of that so that the insurance matches.” We just wouldn’t miss any of those things. What FinTech does for us is help achieve that and make us more productive to handle those things. So, when a client says, “You know what, once a month I’d like to see this kind of report,” we’re able to set that up automatically in our office. And so, the month ends on the 31st. On the second of the month, we’re able to upload that to a search or a portal automatically and it’s designed for him or her in the time period that they want, in the format that they want and it gives them the information in confidence to make decisions. FinTech does that for us. [00:18:54] Barry: Also, what we’re able to do is change the conversation with FinTech or just like technology in general. So, one of the cool things that we do is and we’re doing it with probably about half to two-thirds of our clients but let’s say the Johnson’s are coming in next Monday to meet with us for a quarterly or semiannual review of their financial plan and investment side and we know that we’re going to spend a lot of time on the investments. There’s a lot of really important stuff from tax to state that they knew increased their umbrella policy. They’ve never done that and we really want to get into the financial planning side. What we’ll do is we use a technology called Snagit to do a screen capture of us reviewing live their portfolio review and we’re trying to get it under 10 minutes. We’re failing at that but it’s usually about 9 to 12 minutes or so. Here’s the key. It’s not talking about Janet Yellen, GDP, unemployment numbers and all those random things that really don’t apply to the Johnson’s. We’re reviewing the Johnson’s actual portfolio review and saying, “Here’s what happened last quarter. This increased. This decreased. Here’s how it compares to the S&P versus foreign. I remember you heard bonds got hurt. Here are your traditional.” And they’re able to watch it, re-watch it leading up to our meeting on Monday and here’s the key. When they want, where they want on the device that they want and they can watch it over and over again. And when we have that meeting on Monday, sometimes we hear from the client, “We’re good on the portfolio side. We just have one question. Why did that underperform?” And we’re able to tackle that and move on to the important stuff. Other times the spouse who’s usually not into it said, “I got to tell you I watch this part and re-watched it, I actually get it. Thank you.” As supposed to doing it live and us talking over their heads and you’re saying, “it’s not correlated to…” Well, what does that mean? [00:20:55] Barry: So, they’re able to watch that in eight or ten minutes between Tuesday and Monday whenever they want and then we can have much more meaningful conversations. So, when you save FinTech and others say Fintech, a lot of times they mean robo advisors and all kinds of things. For us, it’s using technology to have better, more meaningful, personal conversations with clients and as long as we’re curious, we’ll keep adding those systems. [00:21:24] Brad: So, Snagit. I use it too. Love it. So, let’s say you send a 10-minute video, now these reviews, are they always in your office or do you ever do them virtually like via Zoom like what we’re doing here today? [00:21:37] Brad: Yeah. Okay. So, it sounded like you send the Snagit, the 10-minute kind of recap of their portfolio prior to their actual review appointment. Are those appointments always been done in your office or do they sometimes just say, “Hey, we prefer to do them virtually?” Have you gone there yet? I’m curious. [00:21:53] Barry: Oh no, no. About a third of our clients live outside of our area so absolutely. No, we do them virtually. We haven’t done a lot of Skype stuff only because for an hour for me to stare at the camera versus down at you like this and a lot of times if somebody else is talking in the office or I have something else going on, I get distracted. So, if I’m on a conference call I can make sure that or let’s say I just want to look up certain figures and just verify things while I’m on the phone, it becomes distracting if they see me typing and that stuff. So, I haven’t gone to the Skype quarterly review at this point. We do have Skype and talk to clients but not as much the portfolio review. [00:22:38] Brad: So, essentially, here’s a quick recap. Any questions? Quick phone review. Make it convenient for you. I’m speaking to your clients. Make it convenient for them. [00:22:47] Barry: Well, we do the questions. Once they’re able to take eight or ten minutes and digest the portfolio, the investment side, the question is can we get to the rest of the agenda meaning we want to make sure that we fund the 529s this year. You sold your company. We want to make sure that you’re paying state taxes this year versus next. What else have we missed? We want to talk about retirement. You’ve been discussing retiring next year for five years. Where are we on that? And really diving into those meaningful conversations, things like what do you want to leave to charity versus your kids and not dive into a large cap value and how dividend paying stocks underperform for this quarter. It helps us get away from that. [00:23:37] Brad: Basically, talk about stuff that actually matters in their life. [00:23:43] Brad: So, Barry, I want to rewind a little bit because you said a little bit ago, as you scale, as you grow your business, how you’ve really tried to focus on what if we’re only serving one family and what I see in most offices is the exact opposite. It’s as they scale, they create these systems and then it feels like you’re serving the masses as a financial advisor as opposed to making them feel special like they’re the only client that you actually have. So, you’ve been kind enough to offer to share a video of your keynote from a Schwab conference you did a little while ago so we’ll get that to show notes but I would love to hear the story of this famous newsletter when you took it from quarterly to monthly and the thing that you had there, I think there’s a really cool lesson. [00:24:26] Barry: Sure. So, when we first opened in 2009, we were small. We had 100 families or so that we transitioned over and we were a couple away of three people. So, we needed to look and feel bigger than we actually were. We needed to show that we were substantial. So, back then, a lot of our peers and things had economic reports that talk about huge economic things and summary of the markets and a whole variety of things. So, we had an outsourced research group called Fortigent. They would provide us this report and we were able to white label it under Glassman Wealth and it’s really cool. So, we decided to take their quarterly and send that out so that – and it was via email and we would send it out every quarter and we thought we’re looking really smart and we wanted to look smarter so we started to send it out monthly. And so, we’re sending out this monthly commentary, here’s what happened in the past month in stock markets, small caps, large gaps and we’re sending it to accountants, attorneys, all of our clients, a huge list, 500 to 600, 700 people and then I got curious. I was wondering who’s actually reading this. Because there were some months where I didn’t have the time to read it and we needed to get it out so somebody in my office would just take it, put our logo on it and send it out. I wasn’t even reading it. So, we put in the foreign investment section a little line that said, “Hey, curious to know who’s reading this. Reply with a word Starbucks and we’ll send you a $50 Starbucks gift card.” And it cost me $150. Three people actually read that paragraph and responded with Starbucks and one of them I couldn’t believe. One of them is a retired client who just doesn’t have time to get anything done and I called him. [00:26:26] Barry: I asked, “Why are you reading this?” He said, “I read everything you sent me.” And he’s like one of the rare gems that actually reads everything. Most of our clients they just don’t have time for it. And here’s the amazing thing. I checked with an estate planning attorney or two, and I said, “You get our economic commentaries.” “Yes.” “Do you read it?” “No.” “So why not? I’m just curious.” He said, “Well first, I get 26 of them and they all come out, they all say the same thing and some of them say interest rates are going up or down, who knows.” But the other thing is if he really cared about GDP or what the stock market did last quarter, he wouldn’t wait until the 15th or 18th or 25th of the following month to know that stuff. He’d pick up the Wall Street Journal the day after the end of the quarter and look and see what the stock market did that past quarter. So, the thing is if you really cared, you just log onto a website, Google Finance, and see that stuff. So, to see it from me, we needed to do other things to make it more personal, more meaningful. And here’s what our communications mandate, this is what we learned. Our communications mandate has to have three things, here’s what’s going on in the world which is where most people stop. So, this is the stuff Janet Yellen, the currency, all of that stuff. So, here’s what’s going on in the world. Number two, here’s how it impacts you. Well, you happen to own foreign stocks and here’s how currency is affecting you. And number three, here’s what we were doing about it or here’s what we’ve done about it. So, after the election, great example, yields soared, bonds got crunched and all of the media was reporting, “The bond rally is over and bonds are getting hurt,” and I put together a video that caught into not only here’s what’s going on in the world, interest rates soared with a pro-America first president. that they had over the prior year and then you also have these kinds of bonds that are gaining because of optimism in the economy. So, when we’re communicating with clients, it’s not enough to just say interest rates are going up and here’s how many basis points and duration and so forth. To show clients here’s how it’s impacting you and here’s how we either we thought about it in the past or here’s how we’re thinking about it now and moves that we may make, that’s really the communication mandate as opposed to just shoving out stuff to make us look smart. [00:29:14] Brad: Yeah. It’s interesting. We live in an instant gratification world now but 20 years ago, before the Internet and people googling what’s going on in finance, that’s probably a great piece. They wanted a newsletter with economic updates. And just going back to something you said earlier about you want to show up differently, you kind of want to scratch the record when they see you versus every other financial advisor and I see the exact same thing as the newsletter example on financial advisor websites as well. You see these little calculators. Every financial advisor has the little financial advisor calculator like 15 different ones and I know you have some strong feelings about financial advisor websites. So, now I know I’m opening up. This could go a lot of different directions but let’s just share what you think about the typical financial advisor website and maybe some things that you do differently to create a different impression on your client’s prospects. [00:30:11] Barry: Sure. So, one of the things that – because I paid to have calculators on a website many years ago and somebody said something. It was, again, at a non-industry conference like, “Don’t do what others can do just as well or better than you can.” And when you can go on to T. Rowe Price or Yahoo Finance and have a mortgage calculator or a retirement calculator and things like that, we don’t need to do that. When people believe in our industry that having a place where you can get a stock quote on your financial advisor website and the stock quote, by the way, is usually a 15-minute delay much like the dial-up AOL days, when you can go on CNBC or Bloomberg.com for free and get an instant quote. You don’t need that component to look smart or special or sophisticated. There’s nothing smart, professional, sophisticated about being able to look up GE stock price from that day. There’s just not. There used to be but in today’s world, it’s just not. [00:32:09] Barry: I knew you’re headed somewhere. Go ahead. [00:32:11] Brad: Tell me about your thoughts on how a lot of financial advisors really just they fee only the heck out of that widow they just helped. Some of the common words and terms that we just see just all over financial advisor world. [00:32:24] Barry: We all say the same things. We all say, and at the conference actually did a word, what’s called a wordle, where I had an intern gather the About Us pages of I think I saw 150 or 200 different RAs and independents. [00:32:45] Brad: If I remember the conference, very successful RAs. [00:32:49] Barry: Oh yeah. These were all the top largest RAs and they’re all saying things like trust and objectivity and you’ve got to realize that you may think that’s special but when’s the last time you looked at a top list from Barron’s or your city and went through website to website just to see that we all say the same stuff. So, the real question is how can you interrupt the pattern and be a little different and show people what it is that makes you different or special? And that’s what I think sets us apart which is we put pressure on ourselves to not just say that we do this but to actually show on our website that we do it. And part of the culture we have here is when we find ourselves coming through for client after client, for example, right after tax time we take a look at all of our clients’ tax returns for as many as we would share them and we’ll put together we’re finding this. They didn’t deduct our fee or they forgot this. They may need to refile. We learn something new. So, we’ll collect that, how can we put that on the web to share that with the rest of our clients and then, by the way, the world. And as opposed to saying we’re smart and curious on our website which by the way is free and easy, anybody can do that, how do we show that we’re smart and curious and give it away? So, that when people go to our website and they see like, “Okay. My advisor never brought that up and my advisor doesn’t talk to us this way.” I actually understood this and I’m going to save some money. That’s really smart and professional without us having to tell them we’re smart and professional and it goes through objectivity on our website that I did something. [00:36:03] Brad: That may be the coolest thing I’ve ever heard a financial advisor say. I really – it’s something I battle. I mean we work with financial advisors all over the country and what you find is there are two mindsets. There’s the scarcity mindset where it’s hoard everything, keep it all, this is just for me, I don’t want my competitors to have it. You find the guys like yourself where it’s like, “Hey, there’s plenty of business out there for everyone.” I guarantee that win new clients. You probably don’t know it. They probably don’t say it but I guarantee just having that mindset, that tells a lot about who you are and who your firm is. [00:36:35] Barry: It shows them who we are and that’s the key difference. It’s we’re trying to capture the stuff that we tell prospective clients. We’re trying to put all of that out there and it’s the Thomas Keller example. When I gave the Schwab talk, three of the comments were, “I wonder why Barry is sharing all this information? Why would he give away all of his secrets?” And it’s funny in that Thomas Keller, by the way, Thomas Keller is the chef at The French Laundry and he came up with a cookbook. I think I have it back there on the counter somewhere because I’m not going to make any of the recipes but I have it in the office. And people went like, “Why would he give away all of his recipes?” Brad, now that we have Thomas Keller’s recipes, what if we take those and just open up our own French Laundry? Wouldn’t that be great? I mean, we have the recipes. We could just – we’ll open up one in every city and we’ll compete and we’ll rule the world. It just doesn’t work that way. [00:38:31] Brad: I have one exception to that rule because I just bought a salad at McDonald’s because my kids made me go to McDonald’s. [00:38:37] Barry: That’s what I just said. [00:38:38] Brad: I’m not eating. [00:38:39] Barry: No, your kids are eating Donald’s. You’ll, therefore, have a salad. But if your culture doesn’t exude, if your website doesn’t exude, we are transparent. We are going to give it away and you just tag on the salad. You just tag on this transparent thing of, “Hey, here are other local advisors.” It’s going to seem fake and phony like McDonald’s salads. [00:39:56] Barry: Yeah. Now that you mentioned on your podcast, it’s going to blow up. We’re going to crash the servers. [00:40:03] Brad: Skyrocket. And we’ll throw it on the show notes too because I’ve been on there. I mean you took a picture of Lebron James. That made it to Sports Illustrated. You’re good. And I’m not just saying that to build up your ego. You’re a very good photographer and I believe the piece of art there in the background, viewing the video. Where was that taken? [00:40:20] Barry: That’s Positano with lightning crashing into Capri in the background. That’s one of my favorites. [00:40:29] Brad: Which is also on the website. [00:40:31] Brad: Yeah. I remember seeing that one. So, okay I’ve come full circle here. So, this About Us page speaking of showing up differently, you’re showing up here and like, “Hey, here’s some passions. Here are some hobbies. Oh, here are some of my work that I’ve done, check it out.” In fact, you’ve invited a few of our mutual friends from mastermind talks to go on a photo shoot that you’re doing in New York City that I’m jealous that I can’t make it out to. But let’s just go full circle with this. [00:40:57] Brad: Not only are you showing up differently. I would love to hear how has incorporating that into your business both your website and just who you show up as a person, what has that look like on the other side as far as how prospects interact with you, the conversations it creates in the office, maybe some referrals or other things that that I guess kind of created around that story and who you are. [00:41:20] Barry: Sure. Well, it goes to your authenticity and I’m not faking the fact that I’m obsessed with photography. I paid for most of college with photography. I had a photography business and if I wasn’t so awfully colorblind, I would be a professional photographer. No, it’s terrible. And so, the question is how do we get that authenticity through on our website? And I’ll give you some examples that, specific examples that anyone can do and this stuff’s easy and it helps build relationships when it’s toughest meaning before you get to know someone in person. How do you build a relationship through a website? So, let’s say we have a prospective client coming in to visit us. They call so-and-so referred and we’re having a conversation with them. And we book an appointment for two weeks from Tuesday and they’re set to come in. Well, a week before, they’re going to get an email from us and it’s not an email from an executive assistant, “We’re confirming that you’re attending and Barry’s good, with Barry and here it is and here’s a calendar appointment,” which is usually what you expect. But what if you get an email that starts with, “Hey, it’s not every day you get to meet with a financial advisor for the first time.” And this may, in fact, be something that starts a long-term relationship. We wanted to send this email to let you know who’s going to be in the meeting, what to expect and some little tidbits that really drive us. And it reads as if you want to get to know those people as opposed to sending the everyday email that you would get from a dentist office to confirm the appointment. [00:43:13] Barry: What if you got something more special like that where it says, “Here’s this person who’s going to be – not only will Barry be in the meeting but Travis Russell is going to be in the meeting. Here’s a link to his bio and by the way, you got to read a bit about him at the end. Make sure you read the end of the bio because he actually played hockey at Fenway Park. You got to read this and, yes, he has done this.” So, for you to get to know these people before that you actually walk into the office, it interrupts the patterns. Let’s say they’re meeting with three or four different firms and what has a little fun, a little whimsy, shows a little passion and by the way, UBS brokers have passions. They may run marathons or Ironman or that crazy CrossFit cult. Who knows? They have those but they never share it and they never build on that until they become a client. So, to interrupt the pattern and share more about yourselves and be a bit vulnerable and say, “You know what, I tried out for the PGA Tour and it didn’t work and here’s what I learned from it,” isn’t that far more important and shows character than, “I got this degree 26 years ago?” By the way, not only doing that in an email but how about interrupting the pattern of an out-of-office automatic reply? And I don’t know if you’ve seen this or heard my story on this, Brad. [00:44:46] Brad: I haven’t. Share. [00:44:47] Barry: So, you send out emails every now and again and you get automatic replies. What do 99% of them say? [00:44:54] Brad: Out of office. Please contact this person XYZ. [00:44:58] Barry: Does it say where they went? [00:45:01] Barry: Does it say what they’re doing? [00:45:02] Brad: Unless you’re Jayson Gaignard then it does but other than that, no. [00:47:05] Barry: So, that when I get back, I’ve got additional conversation. “I want to see the star trail picture.” “I’d love to see how did you capture this or this?” Or, “What was the book that you mentioned or the,” so when they send an email and anybody here in the office we’re being transparent letting them, “Here’s where we are. Here’s what we’re working on or here’s something personal that we’re trying to achieve while we’re away on vacation.” And all of that it interrupts the pattern and shows our clients and referral sources, centers of influence, we’re transparent, we’re human, approachable and we don’t have to say it. We can actually show them. [00:47:56] Barry: Yeah. Oh, by the way, Courtney can handle everything you need but so can these other – and so as opposed to, “I’m busy. I can’t handle your stuff. Here’s another person.” It shows some personality. The same is also true in signature lines. How many emails, Brad, do you send out a day? [00:48:17] Barry: Yeah. So, there’s an ad. There’s ad space at the bottom of your email that what are the things that you want people to do or see and how often do you change it so that they’re going to look back and say, “Oh I got an email from Brad. I want to see what he is going on down below.” So, for us, we won this Best Place to Work thing. We put together a fun video. It’s down there below. “We did a new About Us. Here’s the best and worst About Us videos you’ve ever seen,” and we link to them. So, that we sent an email just talking about estate planning documents and it gets them to our page and it gets them engaged a bit more into what’s my financial team up to. [00:49:02] Brad: So, we’ve kind of danced around this topic. I just want to hit head-on because if we don’t hit this, I’m not going to forgive myself. [00:49:21] Barry: Why do you think that is? [00:49:24] Brad: I think there are a few things it stems from. I think a lot of it is in financial services a lot of times especially how most financial advisors start out, they don’t start out like a doctor or an attorney where you have a team assembled around you. You start out as a one-man show or one-woman show and then you become a victim of your own success. It’s like, “Oh shoot, I should’ve hired an assistant six months ago and it’s this crazy scramble for help,” and then some bad hires made along the way and not having intentionality of what role they’re going to serve in the firm. So, you see higher turnover in a lot of offices in financial services. I’m sure you’ve seen it too, Barry, as far as other firms that you’ve had experience with. So, I think it’s incredible to run a financial services firm and be awarded Best Place to Work. Now I’m going to bring this up just because I know you’re always trying to get better, Fifth Best Coffee which I know created some massive changes internally in your firm. [00:50:21] Barry: Hold on. Go back to the reasons why for a second. We’ll go to Fifth Best Coffee and the fun we had around that. I think that there are some other reasons why financial firms don’t make these lists and number one, and physician practices sometimes don’t as well, is that we enter these businesses as a practitioner. We are financial advisors, financial planners and then by the way we start up our own practice. So, we don’t think of ourselves as a business who could X, Y and Z. We think of ourselves we’re financial advisors and we have a group around us. The other thing goes back to what I said earlier which is learning from other financial advisors. At financial conferences, they don’t talk about building culture that gets every employee engaged. They talk about leveraging yourself in a financial model. They talk about using efficiencies and FinTech. They don’t talk about building culture like they do at other conferences where that leads the discussion. So, I think those things have a lot to do with it. The people who think outside of the financial services industry, I think those people likely make the lists. [00:51:39] Brad: I heard it stated that as a financial advisor if you’re going to scale and grow a real firm, the sooner you start thinking of yourself as a CEO versus a financial advisor, the quicker you’re going to start to make massive changes in your practice. [00:51:52] Barry: Mark Tibergien said it best. Mark Tibergien books are fantastic on this and he said something a long time ago that really hit me which is you’re not a business owner. You’re self-employed. And it’s so true. So, many in the financial services industry they own a business but they’re not the business owner. They’re self-employed and have people around them and the more people can think like a business, the better off those businesses are going to be. And now let’s dive into the Fifth Best Coffee. [00:52:33] Barry: Sure. Just a quick thing on the Washingtonian named us Best Place to Work and had different subcategories of Best Career Growth, we were ranked number one. Best Benefits, we were ranked number one on Washington, I mean, for any firm, any size and then they had Best Coffee and we were number five. And just the culture in our office, we were pissed. We hired a barista to come in, filmed it. We bought a new Starbucks machine. We have Bulletproof Starbucks and Dunkin’ Donuts ground and we sent all of that to Washingtonian and just like, “Okay. We are no longer Fifth Best Coffee.” So, just to show how fun our culture is, making Best Place to Work was great but wait a second we’re offended and we can do better. Now it’s just a blast and showed them who we really are. [00:53:26] Brad: What did your coffee look like to become fifth best? I’m curious. I want to know what that was. [00:53:30] Barry: It didn’t matter. It was, I mean, you’re talking about fifth best coffee of a thousand companies that applied for this thing so it doesn’t matter what it was. And even if we had the Starbucks machine before, we would still up it and have espressos and we hire a professional frother just to do lattes just waiting around in the kitchen for a fun viral video. It didn’t matter why we got it. It was just fun to get upset and as a team jump all over it and send it back to Washingtonian. [00:54:07] Brad: Let’s dig in a little bit there because it’s the little things I found in financial services and like you said you’re competing against everyone. You’re competing against the Ritz-Carlton experience. Let’s say I’m a new prospect. I’m walking into your lobby, into your firm. What is the intentionality with that experience that you’ve created having the best coffee in the DC? I guarantee you’re going to be number one at the list if you’re not already. But having the intentionality of all the way down to the coffee that we pour in their cup is going to be the best coffee, what other things have you done to create this world-class experience in your office? [00:54:42] Barry: See, there’s the adjective now, the world-class experience. And it’s really the – and you said it there, I’ll use your other term, intentional experience. And when you walk in, you’re not greeted by a receptionist. It’s just Julia. She’s our Director of First Impressions and that’s what’s on her card. So, when the client comes in, it’s not, “Hi.” We know who they are from prior times that they come in, “Do you want black coffee and we have new mint tea. You had the peppermint last time. We have a peppermint spearmint blend. Do you want to try that this time?” And that stuff is easy. The good news, we have few enough clients that we can know those things about people but even with prospective clients, “You must be the Johnson’s. How are you? I’m Julia,” and she comes around. At Nordstrom when you check out they don’t just hand you the receipt. They grab the bag. They walk around, shake your hand and look you in the eye. And it’s such a little thing. The gang here happens to love not only coffee but tea. So, how much as an employer does it really cost to have a whole variety of teas? By the way, it’s much more expensive than I thought. Holy moly. But in the big scheme of things to have seven or eight different fresh loose-leaf teas sitting in the kitchen, not much at all. So, Julia puts together a tea and you’d be shocked at how many people say, “Oh wow, I’ve never had this before.” “Try it. If you don’t like it, I’ll bring something else.” And then she does the clear pot of tea which seeps on the thing and it’s not about the tea. It’s that we have the tea anyway and then, by the way, why wouldn’t we put together a menu for clients and by the way why wouldn’t we serve it on the thing that makes it? So, we’re not looking for a world-class experience. We’re just trying to take the best of what we want for ourselves and allow clients to have that while they’re here. [00:56:49] Brad: So, back to the culture. We were talking before prior conversation somewhere along the way and you said you hire on one primary characteristic. Can you share what it is and why? And I thought it was people who never settle, people who don’t think this is good enough. That’s not it. It’s really how within financial planning, it’s combining all of the different disciplines to really think, “You know, what if we did a grant to retain annuity trust but made the beneficiary, the nephew,” which really combines with the curious question we ask the client. “What if we did that because the qualified personal resident’s trust is taking care of the kids and grand. What if we did that?” That kind of curiosity and proactivity for clients shines through everything that we do. So, there are a number of questions that we asked during the hiring process that showed curiosity and one of them is easy. “Tell me about an app that you have downloaded and used but you tell all your friends about,” and a lot of times recently it’s been Waze or something. [00:59:03] Barry: And then, “Okay. So, I’ve never used it before,” pretending. “Tell me about it.” And the best employees talk so passionately about this whatever and, “You got to use this. You got to try it because what you can do is you can send – you go on this thing and you write a note and somebody in Ohio writes a handwritten note to them and it’s amazing. It’s all handwritten and it cost $1.50 plus postage and I do it all the time and as opposed to sending a text or email, thank you, it does this.” And you hear from them this passion about a random app and every now and again they think like, “I don’t really have one.” And I got to tell you, it almost doesn’t depend – regardless of what’s on the resume, if they can’t share – if they’re under 60. No. I’m going to take that away now. No matter what age they are, if they can’t tell me about an app that they use all the time they’re not going to fit in here. [01:00:04] Brad: Yeah. I love that. I just was reading an article – actually it was a The Daily Stoic by Ryan Holiday. Are you familiar with it? [01:00:24] Barry: And sees how they interact with the wait staff. [01:00:28] Brad: But purposefully has the wait staff mess up their order and then sees how they interact. [01:00:33] Barry: Oh, I love it. I absolutely love it. [01:00:37] Brad: So, you see somebody acts in the kind of worst moments and how they handle themselves. [01:00:41] Barry: That’s brilliant. I’m totally stealing that. So, I’m glad I did this podcast. [01:00:46] Brad: Hey, I’m trying to bring value back to you, Barry. I don’t want a one-way street here. [01:00:51] Brad: Let’s go one other place here that I want to make sure we get to as well. When I was chatting with Ian in that 20-minute span, he said something. It was almost an aside but it was so powerful and so important for financial advisors that I want to dig in. [01:01:07] Barry: Ian does that sometimes. [01:01:08] Brad: He does. He’s got little nuggets of knowledge. So, he was talking about you and he said he was with a previous advisor that was kind of more your day trader guy and he said, “I basically have something happen in the market and I check in and then as I got to know the firm basically it was this team,” so speaking of the culture that we’re talking about and hiring curious people. [01:01:34] Barry: I’m sorry. You’re talking about that other firm or Glassman Wealth? [01:01:37] Brad: I’m sorry. Your team. [01:01:39] Brad: Now he started talking about the team and then he basically just said, “Well here’s basically what I tell anybody that asked me about financial advisors is just check the obituary and if Barry’s in there,” and he says this but then he says, “If Barry and his team is in there then give me a shout.” And so, I want to hit that because one of the biggest struggles for financial advisors as I’m sure this hasn’t been easy for you either is how do you transfer that trust that he has with you to the team? Part of it is in the email intros. You already shared some of that cool stuff but are there other things you’re doing, frameworks of here’s how we transfer trust so it’s not just Barry, I, it’s we, the team? [01:02:23] Barry: Sure. And that’s where you can’t tell them. You got to show them and it happens in meetings. So, for example, one of our current vice presidents, I mean, our two vice presidents, they would be in our meetings and the question is, “Am I running the whole show in the meetings or is this other person adding tremendous value?” And in that meeting, is that person saying things that – are they pulling out nuggets that I wouldn’t have? And you can’t fake that. There are some people who can and do and it works. You see this. I’ll sound surprised and that’ll boost you. It’s got to be genuine and what we’re told is in our prospect meetings and client meetings, we’re real. We’re actually – so we’ll say at meetings, “Travis, are you sure about that?” He goes, “Yeah.” And we’ll turn to the client and we’ll say, “You hold on because we’re about to wager on this,” and then we’ll go back. Showing that mutual respect of challenging each other even in front of the client and being real, that goes a long way to if I’m treating them as peers or even asking them things like, “Hey, let me ask you something on social security if they did this and this,” and I know that they’re our firm’s expert on social security, they’re showing the client that they know this stuff. An email introduction saying this is your relationship manager and that’s another thing, though, is the titles. No one’s looking for a relationship manager. They want somebody to lead their financial lives. [01:04:19] Barry: So, the more you can show that the people on your team have your trust, respect and expertise, the more a client is going to go to them and not bother you. And in all honesty, the role of these folks, the financial advisor here at Glassman Wealth is to know the family as much and as well as possible to apply the smart, curious, personal ideas to them. So, the question is who at the firm knows that family so that when we’re sitting around saying, “Hey, here’s a high yield muni fund that we’re going to put in portfolios or estate planning, we want to consider doing X, Y and Z,” they have few enough clients per advisor to know that family have the conversation, take the time to educate them and get them on board with the strategy. So, if you explain it like that and you show them in client meetings the respect and trust you have in them, it’s in everyone’s best interest for them to be the lead moving forward. The other thing is you got the check your ego at the door. It’s having clients for 20 years and saying, “Lindsay’s going to be your primary contact because she has this expertise in nontraditional marriages and adoption and foreign funds. You’re going to be very well taken care of and you can call me whenever you want. Here’s my cell phone number.” The trust is just there and they’ll try it and of 60 or so clients, one’s come back. No problem. [01:06:00] Brad: That’s a lot of lessons there. It’s the same thing on my team. Back in the day, I was everything, everything my clients needed because I was the only thing and today Brady and my team if we’re going in-depth product knowledge, he’s like rain man on my team. The guy does not forget anything. [01:06:17] Barry: But you just described him so that I now know they’re somebody you know and trust who knows this stuff more in-depth than even you do. So, I’m not going to bother you. If I can actually with your permission have access to this guy and talk to him, I’m actually grateful that I don’t need to bother you to go to him and back and forth. It’s a win for everybody. [01:06:40] Brad: Yeah. You serve to the higher level. That’s what everybody wants, right? [01:06:45] Brad: All right. I know where wrapping here pretty soon so if you’re good for a few more minutes, Barry, we’ll throw a couple of philosophical questions at you. [01:06:51] Barry: What have you got? [01:06:52] Brad: All right. So, you referenced books earlier. Is there a book that’s made the biggest impact on you that you’d like to share or secondarily, to give you a little thinking time here, is there a book that you’ve gifted the most over the years to others? [01:07:06] Barry: Small Giants. Small Giants is about – it’s a really easy read and it’s about 15 companies who decided to excel versus grow big and at Glassman Wealth, and I’ve handed it out a ton. It’s in my lobby. We don’t have CNBC or the Wall Street Journal in the lobby. I have five or seven books that clients can take with them and one of them is Small Giants. And the big thing there as a business owner, if I was driven by assets under management, we would do a couple of things differently. We’d lower our minimum. We have a $2 million minimum because we want to grow slowly and get to know all of our clients. We take on breakaway brokers meaning we take on advisors with hundreds of millions of dollars under management, put them under Glassman Wealth. So, we don’t do that. We grow organically. What else would we do? We’d merge with other firms or by other firms. We have decided to grow slowly and smartly to get to know every client and with that, we give up bragging rights. We give up probably some profits but we also give up a lot of distractions as well. So, it tells a story of the Zingerman’s Deli in Michigan and how they said no to so many things and Anchor Steam, how they were asked to be the beer of MGM when they were building in the 80s and they said, “No, because we would have to really expand.” So, it’s my favorite business book and really explains our philosophy almost more than anything else. [01:09:15] Barry: Yeah. Schwab and Dimensional Funds, they do these peer review surveys and with Schwab each and every year for our peer group. We’re here on peer group of average client size, client per relationship, if you will, and then have the fewest number of clients given the size of our firm. And our profitability, we just passed $1 billion under management. If we had triple the number of clients with the same assets we’d be far more profitable because every client would be paying 1% but because we have larger clients, they pay less. And so, for firms our size, I’m trying to say this best, we always want to have the fewest number of clients. It just makes sense. Added benefits. It benefits them. [01:10:13] Brad: You left a fun fact out. Not only did you pass $1 billion once. Didn’t you actually pass it twice? [01:10:21] Barry: So, yeah. The day I got back from mastermind that Monday, I gave them my office. I called them, said or text, “We hit a billion dollars,” and I think that Tuesday the market was down so we went under a billion and then the next Wednesday we hit a billion again. So, I don’t want to brag but we hit a billion twice in a week period. [01:10:46] Barry: And we’ll probably zig and zag given market performance and things a whole bunch of times. But here’s a thing. We didn’t send out press releases. We didn’t brag to our clients about it. We didn’t do much of anything. I think Gabe posted on Facebook something but that’s it because hitting a billion doesn’t matter to our clients. My mother-in-law, she’s thrilled. I definitely told her but because it only justified the billion dollars that she had said her son-in-law’s been managing for the past probably 10 years. But from our client’s standpoint, bigger isn’t always better so it’s up to us to show our clients, “Hey, how we’ve grown. Here’s how we’ve invested our dollars on your behalf to do more for you.” But the billion-dollar level for most of our clients it’s not positive. It’s either neutral or negative. [01:11:40] Brad: Yeah. When you hear the word successful, who’s the first person you think of and why? [01:11:46] Barry: Wow. First person I think of? It’s really, I think Jeff Bezos right now. I’m in awe of the destruction that he has and the momentum behind his company and forget the delivery business. Forget just buying stuff from Amazon. The cloud, the Echo, he just bought Whole Foods recently. He’s going to continue to shake things up in an amazing way and the fact that he failed so miserably with the Amazon phone, I mean, miserably and will keep trying new things, as a publicly traded company, I’m amazed by it. I really am. Even if he weren’t a billionaire, the fact that he keeps trying, I’m really amazed by the things that he’s doing and what he’s going to be able to do given the skill he has. And hopefully, he does for good and not evil. [01:13:00] Barry: Now very true. Very true. [01:13:02] Brad: All right. So, I’ve got a new rule. I’m going to bust it out on you because don’t worry. It’s a fun one. It’s a good rule. [01:13:09] Brad: So, I’ve got a new rule. Anytime I have an RIA or an advisor that oversees a billion plus of assets, I need to ask them this question because I asked this question to Ron Carson and I got a great wine tip. So, if there is a red wine that is off my radar that I’ve never heard of that I should check out, do you have any recommendations? [01:13:32] Barry: Yes. A red wine. What’s wrong with white wine? [01:13:37] Brad: I just like red better. [01:13:38] Barry: Yeah. You haven’t had good white wine. [01:13:40] Brad: I’ve had good white wine. [01:14:15] Brad: Linne Calodo. Can you spell that? [01:14:16] Barry: L-I-N-N-E. Calodo. I don’t know. Google it. [01:14:21] Brad: Okay. We’ll put it in the show notes. We’ll figure it out. [01:14:24] Barry: Sounds great. And I think you can still get on their mailing list which is nice to do as well but their wines are probably priced in the $30 to $60 level but just phenomenal and they’ll blow away your friends who are used to drinking wines in $100 plus range. [01:14:43] Brad: It’s on the list, buddy. Thank you. [01:14:44] Barry: Sounds great. Good talking to you, catching up with you and I look forward to hopefully seeing you in person sometime soon. [01:14:52] Brad: Looking forward to it, Barry. 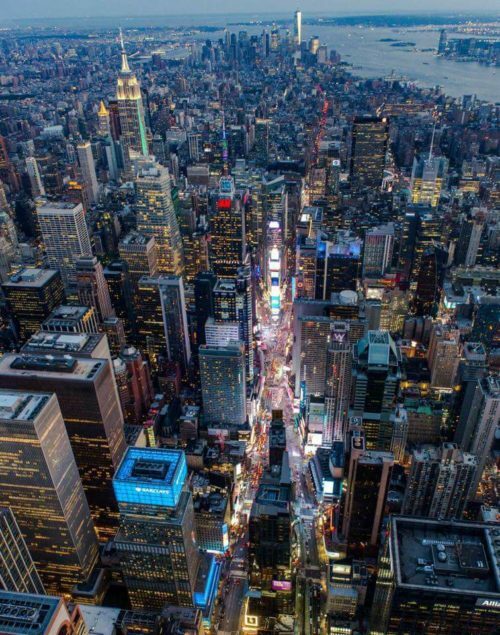 Enjoy the trip to New York. I want to see some pictures. [01:14:55] Barry: Done. We’ll post them below. [01:14:58] Barry: Done. Take care. [01:15:00] Brad: All right. Barry, take care. [01:15:04] Brad: Thanks for checking out our latest show. Here’s this week’s featured review. They come to us from Lockwood Jay. They say, “Great listen for our all financial advisors. First of all, huge congrats on getting such big names on his guests. Some serious firepower in these first episodes so far. Secondly, amazing job of delivering great value add for financial advisors through the podcast. I know that so many advisors spend a ton of time behind the steering wheel and this is excellent info for the drive or in the office with a notepad ready to take some notes. Keep up the great work, Brad.” Lockwood Jay, really appreciate the kind words and super excited for some of the guests we have booked and coming up so stay tuned. More big names to come including just found out one of the largest RIAs in the country will be making a guest appearance soon so I won’t spoil the surprise but some big firepower coming. By the way, for you out there if you haven’t connected with me on Twitter yet and have some ideas on future guests, look me up out there. I’m at @Brad_Johnson and let me know who I should have on. So, that’s it for this week’s show and for those out there who haven’t given a review yet, I’d love if you take a quick second to do so. We made it really easy at BradleyJohnson.com/iTunes and we’d love to give you a shout out on a future episode. So, thanks for listening and I will catch you on the next show.